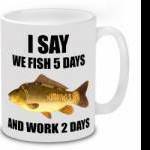 Discussions on all aspects of carp fishing in the UK including questions, answers and all other related subjects. Discussions related to carp tackle and equipment and selecting the right carp fishing tackle for your personal situation. Discussions related to finding suitable carp waters throughout the UK. A section of the forum dedicated to Member Socials, Charity Fish ins and Carp Competitions. This is the forum to post your sunset pic´s or any other picture of the surroundings and wildlife you may have caught. Devoted to arranging a fishing trip to France for carp. Subjects include fisherman's past experiences, travel, accommodation and the location of Lakes to arrange the fishing holiday of a lifetime. Had a great trip to France? Then give us your Catch Reports here. Write up your catch report with the date of the trip so that all can see how it has been fishing. Discussions related to finding suitable carp waters throughout the United States and Canada. This forum is for those of you who like to have a try with other species too. Please keep to the forum rules.